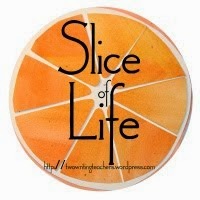 Slicing with the Two Writing Teachers community is a pleasure every week. Happy June to Stacey, Tara, Dana, Betsy, Beth, Anna and slicers! It is the final week of school, our parent 'mini Expo' happened Monday morning for a few hours when parents, siblings and little buddies visited to see students' work and to see the trip board, a tradition that each classroom does, and leaves up for the summer visitors. Some of you asked how we did this, so thought I'd post some of the pictures. If you want to do a bulletin board that will end up a scrapbook, here is the way we do it. There are additional items on the board that may be added, but there are twenty plus 12 x 12 pages that are laminated, and when the board is taken down in the fall, it will be made into a bound book for the class to keep. I hope you enjoy the pictures. 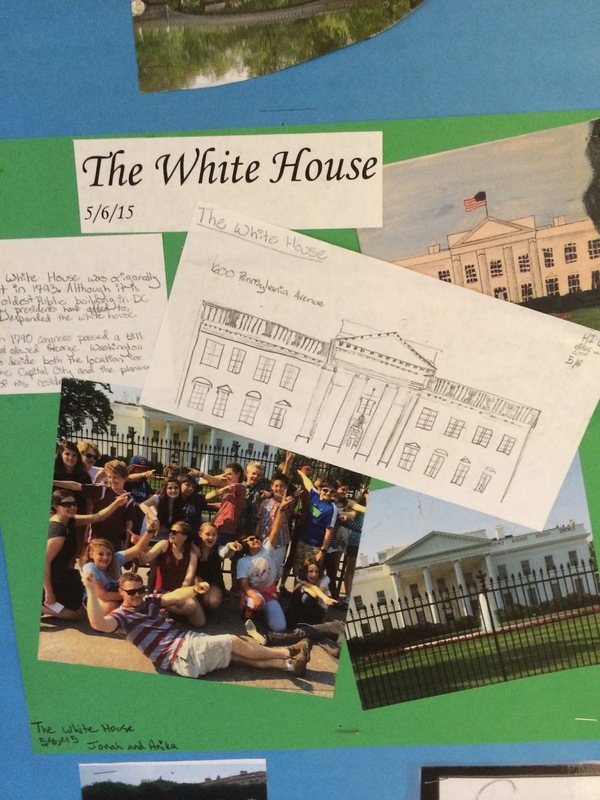 Five students were in charge of the board, but everyone in the class created pages for each day. All I did was supply the paper needed. can see the second one. This will be the cover. in the bottom part of the C.
& it was just awesome. fire was almost out, like our trip! The last day, the travel day that took us home! The visuals of your trip created by the students are SO beautiful. I especially loved seeing them as I live and work in DC! It is fun to see how much my town was enjoyed by your Denver students..
We had a fabulous time, and your town was a pleasure, Sally. Wow! 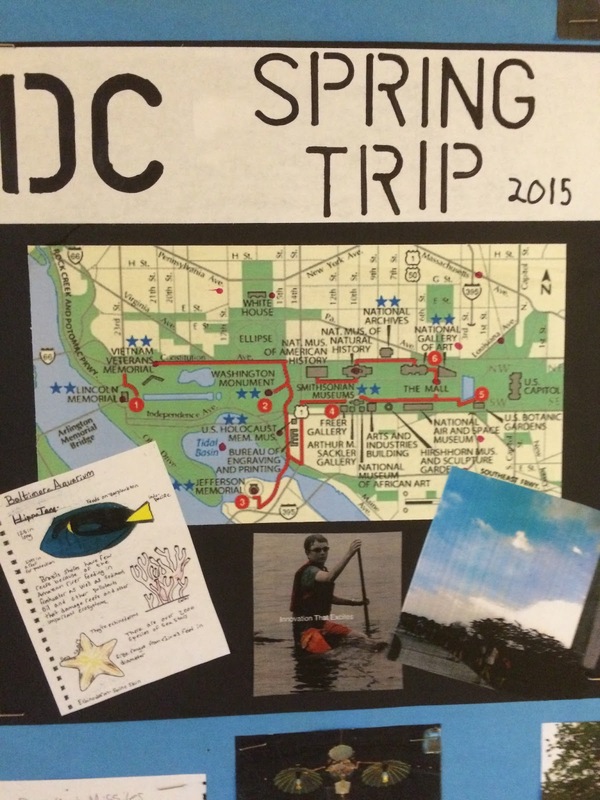 The trip sounds so memorable and I love how scrapbook pages make up the board and will become a book. How lovely and what a fantastic idea. Thanks Kathleen. It works well to do the pages ahead. Wow! Wow! Wow!!! Each and every time I step back and allow the students to create, I am impressed and amazed! That's exactly how I feel about this board...such creativity and communication. It's wonderful!!! Job well done!! Yes, they did a fabulous job, Michelle. I'm glad you like it! 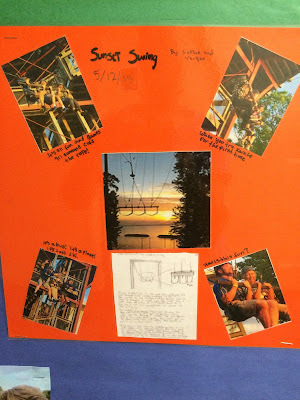 I love this idea, especially since the students had a hand in recreating their memories. This just reminds me of how powerful things can be when we put students in charge. Amazing creativity! They love the doing, and in this, it did bring back so many memories. Lots of the students helped the five in charge, & I heard them talking, talking about this day & that day! Thanks, Jennifer. This is super cool. I love how the board becomes a book and both serve as memories from an amazing trip. Thanks for sharing. Thanks, Katherine, much fun to do, & saves time later as well. Linda, this is SO cool! What a great way to savor memories and build community, while at the same time practicing narrative skills, art, collaborative work, etc. Amazing! Thanks, Laura, you're right on all points, & the students are very proud to show it off as theirs. This is fantastic! I love the way student's created each memory. 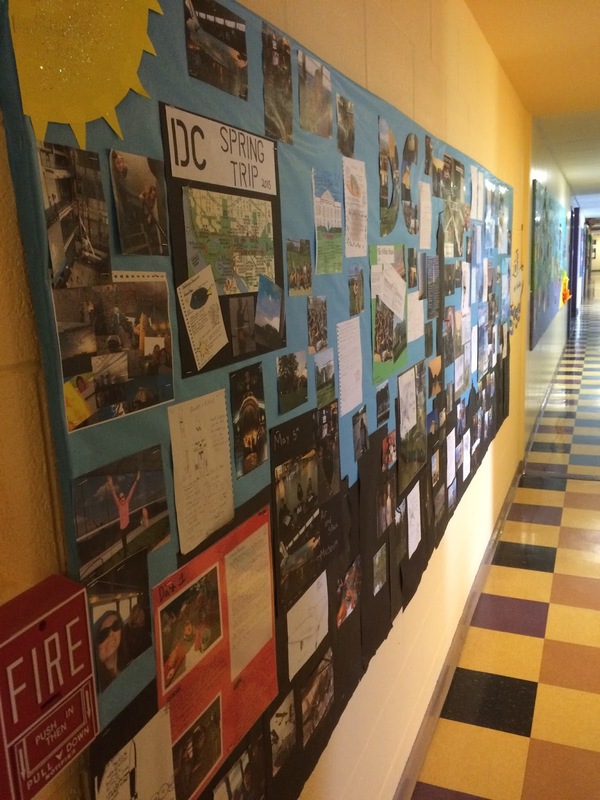 And the bulletin boards are spectacular. We just purchased a big beautiful (now empty) bulletin board for our office hallway. This is a terrific example for us. Thank you for sharing! What a great idea! The fact that things will part of a book in the Fall makes this a lasting memory for those who went and an inspiration of thing to come for those who will follow. I'm sure the parents and siblings love following the path of the board to connect the dots of the trip away from them. So much creativity! Truly a lasting memory. This is amazingly beautiful, Linda - and that you've figured out a way to make a keepsake is even better. All I can say is I love this. Such creativity and heartfelt memories. What an incredible scrapbook of memories. I really admire you for not only undertaking the trip but also for making time to reflect and record your collective memories. A fantastic trip, a brilliant idea, and an exquisite display! Thanks everyone. I just arrived home and am happy you all enjoyed my pictures, and hope you can use the idea in some way yourselves. Linda, this is just amazing! The idea of the board is brilliant, and the individual pages you shared are so beautiful and heartfelt and creative! Simply gorgeous. What memories you will all have for a lifetime! I love the artwork that your students contributed to the board, Linda. What an amazing lesson you have given your students about creating and holding on to memories. Fantastic! What a way to remember! What a great showcase piece! 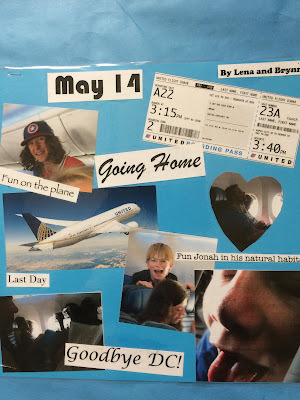 The students' artwork and layouts reveal how engaged they were not just in that great trip, but in reflecting on it afterwards! I'm going to share the idea with son's teacher who plans their 8th grade DC trip.they had a bit of rain on their trip too! I love this wrap-up of your trip and that you kept us involved from the planning stages all the way through to this bulletin board. You've given us a fabulous gift with this post and pictures. The best PD ever comes from our weekly SOL sharing!